Since its creation in 2007, the TTHWF has funded research into Neuronal Ceroid Lipofuscinosis (NCL), Primary Lens Luxation (PLL), Progressive Retinal Atrophy (PRA), Immune Mediated Hemolytic Anemia (IMHA/AIHA), Canine Atopic Dermatitis, Lymphoma, Renal Dysplasia as well as the Stem Cell Treatment of NCL. The TTHWF helped to fund research which led to the development of DNA tests for NCL and PLL in Tibetan Terriers. Information on the status of current research grants and projects is available by clicking on the bulleted links. Learn more about Tibetan Terrier health. OCTOBER 2015 The Tibetan Terrier Health and Welfare Foundation has made a $15,000 health research grant to the University of Missouri that will fund the creation and validation of a panel of Tibetan Terrier-related DNA tests that can be performed at one time with a single DNA sample. According to Dr. Gary Johnson from the College of Veterinary Medicine at the University of Missouri, the ability to conduct multiple DNA tests simultaneously from a single DNA sample will be possible as a result of the University’s purchase of an expensive new scientific instrument called a MassARRAY. The Tibetan Terrier panel of DNA tests is expected to initially include DNA tests for Lens Luxation, Neuronal Ceroid Lipofuscinosis, Progressive Retinal Atrophy, and Degenerative Myelopathy. Dr. Johnson, in his grant proposal to the Foundation, noted that this new scientific instrument will lead to lower DNA testing costs for dog owners, since the cost of the proposed panel of tests is expected to be about $100. The MassARRAY device can be used to perform twenty or more simultaneous DNA tests on a single sample according to Dr. Johnson. The creation of a panel of DNA tests for Tibetan Terriers may also lead to breakthroughs in the identification of genetic mutations that cause rare diseases in Tibetan Terriers. 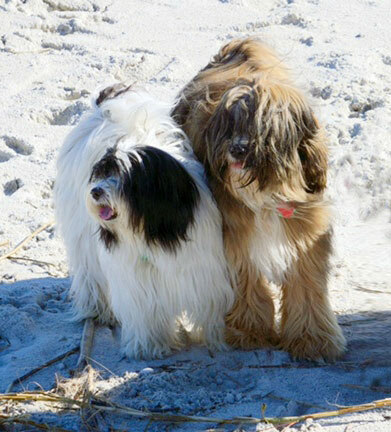 For example, researchers have used computer algorithms to search through millions of apparent mutations to zero in on mutations that may cause rare forms of Progressive Retinal Atrophy (PRA) in Tibetan Terriers. But to prove that suspect mutations are, in fact, the cause of these rare forms of PRA, researchers would have needed expensive stand-alone DNA tests of many dogs in the hope of finding more Tibetan Terriers with the rare gene mutation. Looking forward, researchers will be able to add a test for suspect mutations to the panel of tests for Tibetan Terriers --- a cost effective way to get the critical data researchers need to prove suspect mutations are associated with certain diseases. Stacey LaForge, former chair of the TTCA’s Health and Genetics Committee, described the chance to finally create an efficient panel of DNA tests for Tibetan Terriers, “exciting news.” She added, “this is an idea that the Health and Genetics Committee has been discussing and pushing for over a year now, but the technology has not been in place to accomplish it until now.” Tibetan Terrier owners do need to temper their excitement about getting a panel of DNA tests performed simultaneously from one DNA sample --- Dr. Johnson’s grant proposal advises it may be a year before everything is ready for panel DNA testing of Tibetan Terriers to begin at the University of Missouri. The TTHWF is proud to help sponsor AKC CHF grant #02138 entitled "Development of an Accurate Diagnostic Assay for Canine Hypothyroidism" by Dr. Jan A Mol, PhD from the University of Utrecht. The Tibetan Terrier Health and Welfare Foundation has announced the approval of a $20,000 grant to Dr. Gary Johnson from University of Missouri to further study Progressive Retinal Atrophy in Tibetan Terriers. PRA is a group of inherited diseases that cause the degeneration of the retina over time, resulting in blindness. By sequencing the genome of two PRA affected TTs (one diagnosed with an early onset form of PRA and the other with later onset PRA), they hope to identify the mutations that cause the forms progressive retinal atrophy found in TTs that are not explained by the previously identified rcd4 PRA. (See below for information about rcd4 PRA testing.) Dr. Johnson's proposal is entitled “Identification of Mutations Responsible for Progressive Retinal Atrophy in TTs by Whole Genome Sequencing”. The TTHWF is proud to announce that we will be co-sponsoring a promising study through the Morris Animal Foundation. The study, Determining a More Effective Treatment for Canine Lymphoma is being conducted by Dr. Jaime Modiano at the University of Minnesota. Researchers seeking grant funding click HERE. to help the TTHWF fund current and future research studies. Limited clinical trial investigating the potential of stem cells to treat NCL. Dr. Simon Peterson-Jones is stepping up his Tibetan Terrier PRA research. The TTHWF is proud to help sponsor research through the AKC CHF. Here are some grants we have sponsored. Content Copyright 2009-2018. Tibetan Terrier Health & Welfare Foundation. All rights reserved.